I’m so delighted to share a story with you today from my dear friend Susie Finkbeiner. Susie was my very first writer friend. We met almost 6 years ago when I attended my first writers conference. 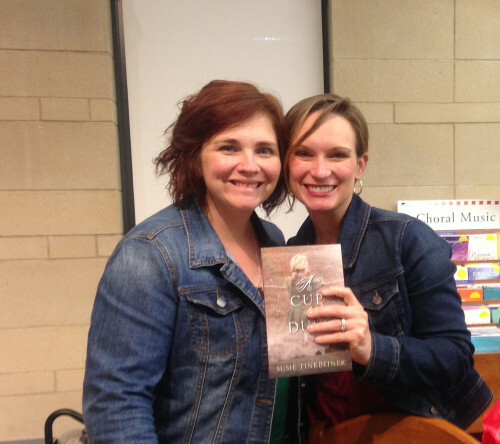 In this picture, we’re celebrating the release of Susie’s third novel, A Cup of Dust. It’s a novel from the Dust Bowl era, and I couldn’t put it down. At the end of this post, there’s a chance for you to win two copies of the book. Read on to learn how (and why 2 copies!). We’re lake people, my family and I. And not just any lake, we love Lake Michigan. 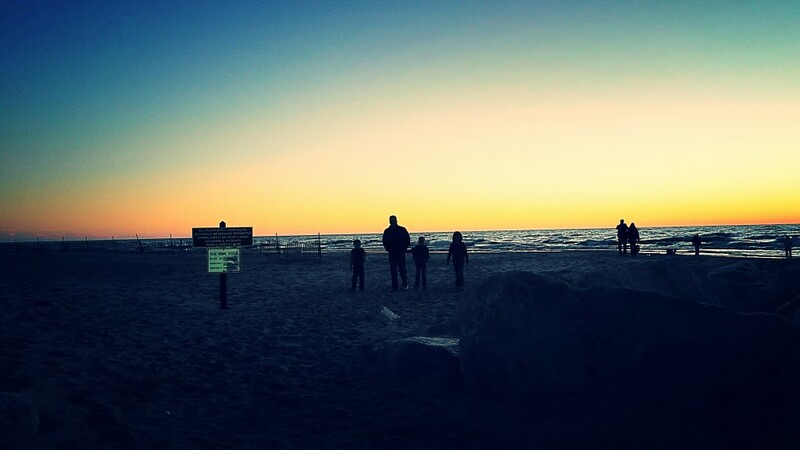 Throughout the summer we make spontaneous trips to Grand Haven where we go for dips in the water, play soccer on the beach, walk the pier, enjoy the Musical Fountain. But it’s the sunset that captures us. 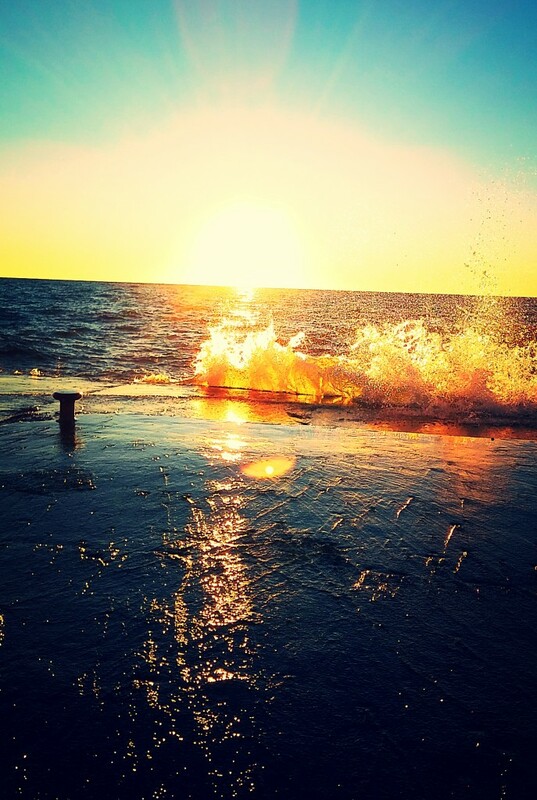 A Lake Michigan sunset makes me feel at home, stirs a longing in me for the too-quickly-fleeting summer evenings. We watch the sky turn from white-blue to hues of orange and purple and red and pink. The sky turns gold for just a moment. We sit close as we watch the sunsets, my family and I. We say, “Look!” a whole lot. On Sunday we hopped in the van to see one last sunset for the year. 5:37 pm. That’s when it would dip down past the horizon. 5:37 pm. That’s when we’d share in the magic. The waves were high, splashing on and over the pier. The water looked aflame as it sprayed into the air. It was a gorgeous evening and a lot of people had the same idea we did. The sun inching toward the water, the whole lot of us turned to watch, to allow our faces to glow orange, to hold on to each other as we watched the moving-painting of God’s glory. I peeked around me at my family as they said, “Look!” and at the strangers who stood near. I was moved, thrilled, grateful to be sharing in that moment. We have those times, don’t we, when we all stop and enjoy something together. When, stepping out of the grocery store, a stranger in the parking lot points out a rainbow. Or when we stop to make a smiley face at someone else’s baby. When we wish the girl ringing up our groceries a good day or have a mini-conversation with someone we serve in our place of work. Not a one of us was meant to travel through this life all alone. We’re creatures made for community, regardless of how small or large. We were created with a desire to share in moments with others. I think there’s a whole lot of beauty in that. What’s a moment you’ve shared, either with loved ones or people you didn’t know? How did that form you? Did you build any relationships because of such a moment? I’d like to give an opportunity for one of you to share in a moment. I’m giving away 2 copies of my most recent novel A Cup of Dust for 1 winner. Why 2 copies? So the winner can share the story of Pearl and her family with a friend, a neighbor, a sister. Use the Rafflecopter widget below for a variety of ways to enter. Or simply, leave a comment on this post answering Susie’s question of a moment you’ve shared with loved ones or people you didn’t know. The winner will be announced next Monday, November 9. 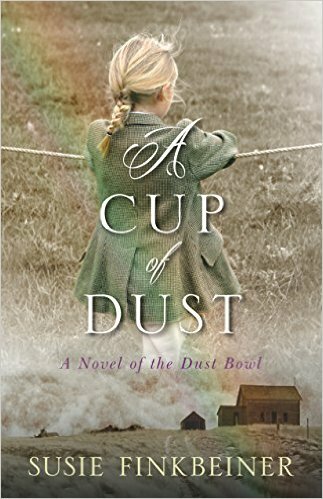 About A Cup of Dust: Ten-year-old Pearl Spence is a daydreamer, playing make-believe to escape life in Oklahoma’s Dust Bowl in 1935. The Spences have their share of misfortune, but as the sheriff’s family, they’ve got more than most in this dry, desolate place. They’re who the town turns to when there’s a crisis or a need–and during these desperate times, there are plenty of both, even if half the town stands empty as people have packed up and moved on. Available now, on Amazon or wherever books are sold. I love Lake Michigan so much too 🙂 We were meant to be together, I love that. You’re way closer to the Big Lake than we are out here. Kinda jealous!! My husband and I went to an artist’s conference in Texas. I don’t consider myself and artist (but being there I realized I am more of one than I thought), and he is an artist. We were in the beautiful Frio River Canyon with nothing to do but talk about creation, the Creator, and how He made us sub-creators. The last day were were there was Palm Sunday, and we ended the weekend with a beautiful, simple, service. When we arrived there we were all strangers, and after 3 days we had a connection to everyone. Nicole, there is artist in all of us, I’m convinced! Sometimes we just don’t realize it. I’m so happy to hear you had a beautiful time and a sweet connection with the others who were there. What a memory for a lifetime!